Born in Winnipeg, Arthur Carlyon Allan played junior hockey for the Kenora Thistles. 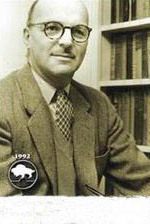 He was Sports Editor of the Winnipeg Tribune (late 1940s to mid-1950s). He authored Grey Cup or Bust and Grey Cup Cavalcade. He was City Editor before moving to sports where his column One Man's Opinion was widely read. Allan supported all sports and was a regular at the Memorial Cup and the Grey Cup.